Are you looking for a cheaper alternative than the Renault dealer network? Sick of paying £100 pounds an hour for the service and repair of your Renault? Do you want a more friendly honest service but still want the same expertise? 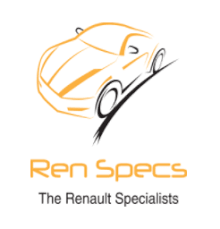 Well Ren Specs is your answer, we can provide everything that your dealer can at a fraction of the price. We have ex Renault dealership staff, both in our office and in our workshop, we have an amazing relationship with Renault, Nissan and Vauxhall dealership parts departments. Therefore we can get you genuine parts at a discounted price and we pass this saving on to our customers! We also have a vast stock of Used and Reconditioned parts available on the shelf, thus saving you money. We will offer cheaper alternative after market parts where available. We will carry out your service with genuine parts and the correct oil, therefore retaining your all important manufactures warranty. All genuine parts carry the full dealer network warranty. We have access to all of the information of the main dealers, parts, technical documentation, diagnostic machines. We have two Renault Clips, this is the latest official Renault diagnostic machine and software, essential for diagnosing, resetting service lights, reprogramming ECUs and much more. We also have other computer systems allowing us to do MORE than the dealers with your vehicle. We can reconfigure new, existing and used ECUs and modules. We have a Renault master tech on site, he is an expert when it comes to Renault electrical systems and diagnosing mechanical faults. We have our own Diesel shop on site. Diesel injection Service Ltd they have all of the latest diesel test equipment and offer new and reconditioned injectors and fuel pumps. Again this allows us to offer a better more affordable repair service. We specialise in an Vauxhall vans, the Vauxhall Vivaro and Vauxhall Movano are the same vehicles as the Renault Trafic and Renault Master.